How much does it cost to travel to Maui? How much money will you need in Maui? $148 is the average daily price for traveling in Maui. The average price of food for one day is $57. The average price of a hotel for a couple is $119. Additional pricing is in the table below. These average travel prices have been collected from other travelers to help you plan your own travel budget. Who hasn't spent at least one Monday morning fantasizing about holding a mai tai on a Hawaiian beach? A trip to Maui may be just what we all have in mind, but it's so much more than a drink on a sandy towel. At over 700 square miles, the island of Maui is the second largest of the Hawaiian islands with a small population of just over 140,000 people. The island enjoys approximately two seasons a year with a mild climate just about everywhere. Rough living, right? 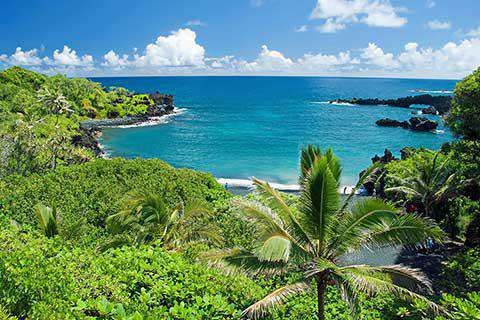 Voted "Best Island in the World" by many in the travel industry, Maui is the center for whale watching and the home a large and lush rainforest. If you want to see just about everything there is to see in Maui travel the Road to Hana. With over 600 twists and turns, this roller coaster of a ride includes waterfalls, cliffs and jungle scenery. This journey is full of detours for swimming, strolling and exploring the hidden wonders of the island. If the Road to Hana left you wanting more there's always the mystical rainforests of 'Iao Valley State Park, the Makena State Park covered in one can only call the epitome of beaches, or you can watch thousands of humpback whales along the coasts  if you dip your head under water you may just hear them singing! You can never go wrong with simply enjoying the beach life in Hawaii. Grab a chair, soak up some sun, catch up on a good book and maybe spend an afternoon trying your hand at windsurfing. No one can deny that the beaches are the biggest draw for tourists in Hawaii. For the more engaged adventurer, however, there are so many things to get up and do in Maui. Go make friends with the giant sea turtles in Malu'aka as you dive deep. Follow the tour boats to "Turtle Beach" for the most amazing underwater journey. If fish are more your thing, you'll find more than 250 colorful species in the shallow waters of the Molokini Crater. Three miles from the Maui coast, this crescent shaped rock houses breathtaking coral that is legendary among divers. This isn't the only spot for fish-gazing, however. There's the cove of south Black Rock, Hanakao'o Beach, Kamaole Beach Park and Ulua Beach. For a taste of the local flair, attend the Old Lahaina Luau. Doused in history and culture, this is the most authentic luau on the island and they'll happily share delicious meals and drinks with all of their guests. If you've come to Hawaii to finally try out your surfing talents, you'll want to hit Ho'okipa Beach, but for the windsurfing crowd, Kanaha Beach is where the action is. With resorts, five star restaurants and hole-in-the-wall dining spots everywhere you look, finding a life-changing meal is not hard in Maui. Try to fill your plate with the best of the local foods: fish, onions, avocados, cabbage, broccoli, asparagus, hydroponic tomatoes, myriad herbs, salad greens, bananas, papaya, guava, coconut, mangoes, strawberries and, of course, Maui pineapple. When browsing the menu, there are certain dishes you'll definitely want to try including lomilomi (salmon), laulua, poi, Portuguese bean soup, kalbi ribs and katsu. However, you can venture away from the tablecloths and candlelight for some cheaper local delights. Roadside stands sell the island's favorites. Plenty of food truck are around the island, and here is a list of the best food trucks in Maui. Don't think twice - just buy some. Coconut candies, fresh smoothies and fruit are just some of the treats Maui has to offer. Maui does offer basic public transportation, but probably not to the places you'll want to visit. Renting a car is a good option as it's inexpensive and pretty simple. Many tourists, however, are able to get to all of their destinations by taking one of the shuttles offered around the island.